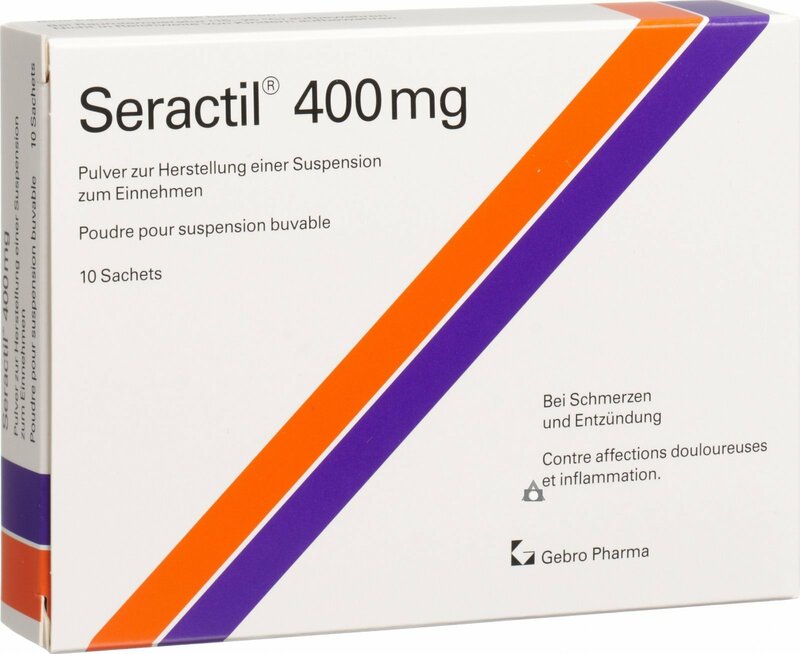 Seractil tablets contain the active ingredient dexibuprofen, which is a type of medicine called a non-steroidal anti-inflammatory drug (NSAID). NSAIDs are used to relieve pain and inflammation. Dexibuprofen works by blocking the action of a substance in the body called cyclo-oxygenase (COX). Cyclo-oxygenase is involved in the production of various chemicals in the body, some of which are known as prostaglandins. Prostaglandins are produced by the body in response to injury and certain diseases and conditions, and cause pain, swelling and inflammation. Dexibuprofen blocks the production of these prostaglandins and is therefore effective at reducing inflammation and pain. Dexibuprofen is used to relieve pain and inflammation associated with osteoarthritis and other painful problems of the muscles and bones. It is also used to relieve other mild pain, such as toothache and period pain. The tablets should preferably be taken with food to help avoid irritating the stomach. The manufacturer has not studied the safety and efficacy of this medicine in children and adolescents under 18 years of age. It is not recommended for this age group. This medicine should not be used in the third trimester of pregnancy, as it may delay labour, increase the length of labour and cause complications in the newborn baby. It should only be used in the first and second trimesters if the potential benefit outweighs any potential risk to the foetus. Some evidence suggests that NSAIDs should also be avoided by women attempting to conceive, as they may temporarily reduce female fertility during treatment and may also increase the risk of miscarriage or malformations. Seek medical advice from your doctor. This medicine may pass into breast milk, but in such small quantities that it is unlikely to harm the baby if the dose is low and treatment is short. However, as with all medicines, seek medical advice from your doctor before breastfeeding while taking this medicine. Dexibuprofen should not be taken in combination with painkilling doses of aspirin or any other oral NSAID, eg ibuprofen, as this increases the risk of side effects on the stomach and intestines. Selective inhibitors of COX-2 such as celecoxib or etoricoxib should also be avoided for the same reason. There may be an increased risk of ulceration or bleeding from the gut if dexibuprofen is taken with corticosteroids such as prednisolone. There are currently no other medicines available in the UK that contain dexibuprofen as the active ingredient.